In saddle stitching, wire consistency matters most, equipment down time means lost revenue. 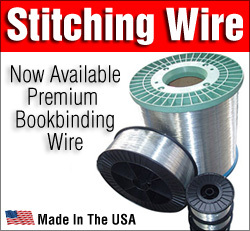 Our premium bookbinding wire is manufactured in the US and promises size, tensile, cast and finish that you can depend on spool after spool. With a full range of products, available in galvanized, tinned and coppered finishes or nylon coating, we can provide all your stitching wire needs. We pride ourselves on exceptional customer service and our wire is priced like lesser grade imports but offers unsurpassed quality not always found with imported wire.